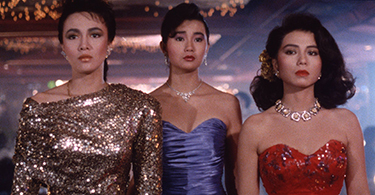 Michael Mak’s intensely personal drama, Moon, Stars & Sun details the stories of four women working as cabaret hostesses with the hope of building a better future for themselves. Despite the fact that she comes from a broken home, May (Maggie Cheung) cares deeply for her ailing mother and works to provide the support that she desperately needs. Gigi (Cherie Chung) works with the hope of bailing her husband out of jail, though the happiness she hoped to find with him upon his release is short-lived when he embarks on an extramarital affair. Veteran hostess, Porsche (Carol Cheng) is disillusioned when an old flame reappears and his intentions are far from the future she had in mind. Lastly, Margarita (Hu Ching) has the reputation as an ice princess, since few people can see the true beauty that lies deep within her tough exterior. Through the lives of these four lost souls, we witness their journey to where they are today, and get a glimpse of what may come of them in the near future.